We are honored and delighted to welcome Father Greg Boyle as our guest speaker at the Presbytery Gathering on May 30th at 7:00PM. Father Boyle will be sharing his wisdom from his latest book, Barking to the Choir: The Power of Radical Kinship. 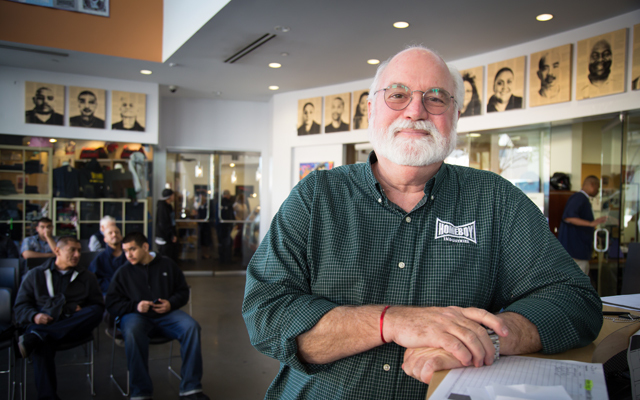 Gregory Boyle is the founder of Homeboy Industries, the largest gang-intervention, rehabilitation, and re-entry program in the world. Read about Father Boyle and the work of Homebody Industries. A native Angeleno and Jesuit priest, from 1986 to 1992 Father Boyle served as pastor of Dolores Mission Church in Boyle Heights, then the poorest Catholic parish in Los Angeles that also had the highest concentration of gang activity in the city. Father Boyle witnessed the devastating impact of gang violence on his community during the so-called “decade of death” that began in the late 1980s and peaked at 1,000 gang-related killings in 1992. In the face of law enforcement tactics and criminal justice policies of suppression and mass incarceration as the means to end gang violence, he and parish and community members adopted what was a radical approach at the time: treat gang members as human beings.